As some of you lovelies know, I fell very ill last spring. I am still in recovery and bedridden for the most part. As such, I had to switch a few things up in my beauty routine. I have not regained the agility to stand long enough to do my regular routine. These tricks have saved my skin and allow me to pretty up when I want a change. I prefer my Noxzema cold cream in the mornings but trying to solely wash that cream off with a washcloth was not happening with me. I still felt the residue because I could not actually rinse my face off. A washcloth just collects the cream and it takes a long time to get that good clean feeling without standing near running water. I knew I had to switch to cleansing wipes. The switch was easy because I haven't been wearing foundation at all. If you are not wearing makeup any facial cleansing cloth will work for you. Remember, these cloths do have soap on them so after you are finished with the cleansing cloths "rinse" your face by sweeping a damp washcloth over your face. Face scrubs give the same problems that washing your face with a cream does if you can't use a stream of water to help you rinse the stuff off. If you need to exfoliate, switch over to an exfoliating cleansing wipe. They usually are a bit rougher or nubbier than most cleansing cloths and should have some AHA or BHA in them like citric acid or salicylic acid. I like Pond's Exfoliating Renewal Wet Cleansing Towelettes. They are not expensive and do not irritate my skin. I love clay masks. They really dig down deep in the pores and help to firm the face a bit. Even when I was mobile, removing a clay mask from my face was a task. There was no way I was going through that in bed. I still needed something that would get inside my pores and help keep my skin a bit firmer. I rely on peel-off masks for this. I used to use peel-off masks when I was in a pinch for time because they were easier than a clay mask. This is exactly why I use them now while bedridden. 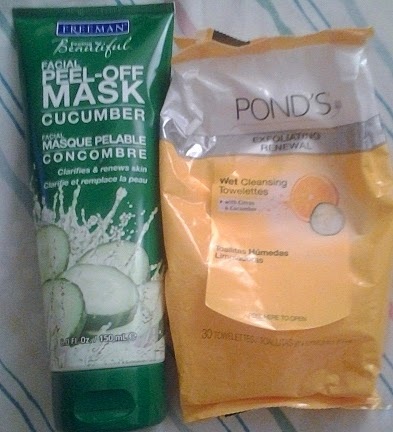 I just apply a thin layer, wait 10 minutes, peel off, and swipe with a damp cloth to remove any bits of mask. Being indoors all of the time is a bit drying on the skin. So applying moisturizer is important. You don't need an expensive one. You just have to make sure you apply it after you cleanse your face every morning and night. Don't forget to keep your lips moisturized as well. Break out your lip balm or lip ointment and keep those lips smooth. How you handle makeup depends on how skilled and patient you will be when it comes to removing it at night. If you don't mind taking a little longer to remove a full face then apply your makeup as you did before. If don't want a lengthier clean up at night then keep makeup simple. For me, simple means tinted moisturizer, picking one shade of makeup to use all over, clear mascara (or skipping it altogether), and smoothing down my brows. Eyeshadow is the easiest item to use for me. I don't need a glam look, just something to add a little color and depth to my face so I don't look washed out every day. Today my makeup routine involved three products: tinted moisturizer (killing two-birds with one stone), a shimmery plum eyeshadow, and lip ointment. After I cleansed my face I applied my tinted moisturizer. 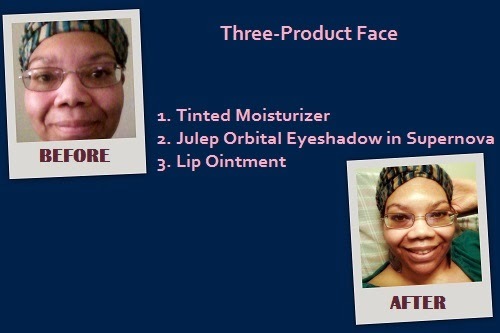 As you can see from the pictures, it helps reduce some redness and slightly evens out my skin tone. I've been dying to use my Julep Orbital Eyeshadow in Supernova. Using my fingers I swipe it over my lids for a sheer veil of color. Next, I apply the same technique with the shadow for my lips. One swipe across for a hint of color only. I then used the shadow as eyeliner. I took an eyeliner brush -- a tapered sponge-tip eyeshadow applicator is fine as well -- swiped it across the shadow and lined my lower lash line only. I squeezed out a little lip ointment/moisturizer and smoothed my brows. I applied lip ointment to my lips for shine. That's it! Nothing fancy just simple makeup to add a hint of color to my face. Even though you are not able to go out does not mean you have look drab or washed out. Maintain your face by simplifying your beauty routine. When you want to add a little color or a lot just do it.